According to an Idaho Fish and Game report, Creel reports were taken from over 2,600 anglers from 19 states and Canada in 2009, with 83% being from Idaho. Washington had the second most number of anglers, with 13% of the total. Anglers fished an estimated 95,000 hours on Coeur d’Alene Lake and an additional 56,000 hours on the chain lakes from January 1 to December 31. Of the Coeur d’Alene Lake effort, 34% was in the northern section (north of Arrow Point), 52% was in the middle section (Arrow Point to tribal boundary), and 14% was in the tribal waters. Forty-two percent of the total fishing effort was directed toward Chinook salmon and 35% towards kokanee. Twelve percent was directed towards northern pike, 6% towards large-mouth bass, and 3% towards small-mouth bass. Anglers caught an estimated 877 Chinook and harvested 729 of them. Harvested Chinook ranged from 14 to 35 inches, with an average of 23 inches. Chinook catch rates were best from late August through December, when anglers caught a Chinook for every 5 to 15 rod hours, and slowest in June-July, when an average of 60-80 rod hours was spent on each fish (see Figure). Anglers caught an estimated 8841 kokanee and harvested 6770 for catch rates of .68 fish/hour and .52 fish/hour respectively. For more than a decade, adult kokanee have been well below Idaho Fish and Games desired levels of about 12 to 24 adult kokanee per acre of water. For the past three years, there were 1.2 adult kokanee per acre. These low densities made it difficult for anglers to find the adult fish and kept catch rates low. Chinook growth was also affected by the low kokanee densities (their main food source), with few mature fish exceeding 15 pounds. Chinook stocking was greatly reduced and the limit was liberalized to help reduce predation on kokanee and allow the population to recover. As hoped, Fish and Game saw a significant rebound in the kokanee population in 2009. Adult densities have increased ten-fold to 12 adults per acre of water. This puts them right at the lower end of our desired range. One and two year old kokanee have also rebounded to levels not seen since before the mid-1990s. With this improvement, the kokanee fishery was open this fall for the first time in three years, and Idaho Fish and Game resumed stocking Chinook salmon. The one low year class is kokanee fry. Idaho Fish and Game estimates the lake contained only 3.6 million of them. That may seem like a lot, but it is one of the lowest estimates on record. Why? It seems the low numbers of adult kokanee in 2008 produced very low numbers of fry in 2009. Fish and Game will be keeping a close watch on this years class and may need to adjust Chinook stocking to accommodate them. How are the Chinook salmon faring? With the kokanee population increasing, Chinook growth is up as well. Several fish over 20 lbs were taken in 2009. 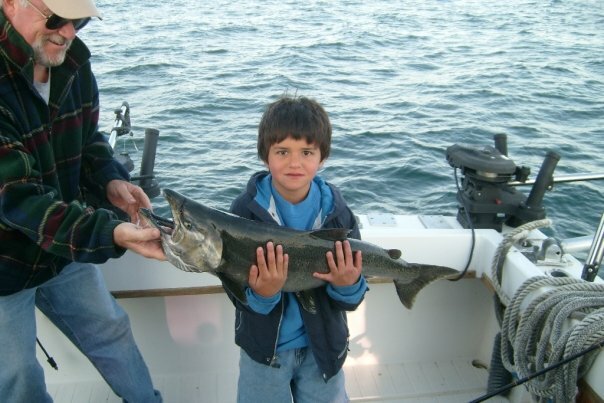 Idaho Fish and Game resumed stocking in 2009 with 20,000 fingerling Chinook. Fish and Game is in the midst of an effort to refine their stocking program as well. Specifically, they’re evaluating June vs. October releases. For the next few years, all hatchery Chinook will be marked with an adipose fin clip and coded-wiretags (CWT). The tags and clips will give us a much better understanding of the contribution hatchery fish are making to the fishery, and ultimately, make for better fishing. This post was written by admin on Friday, January 29, 2010, 21:36. admin has written 6 posts on this blog.